"Today’s Judgement delivered by the Hon’ble Judges of the Supreme Court of India striking down the National Judicial Appointments Commission (NJAC) as constitutionally ultra vires and invalid raise our respect and gratitude for the Judges as defenders of the constitution our panoply of human rights and democracy has gone up sky high. 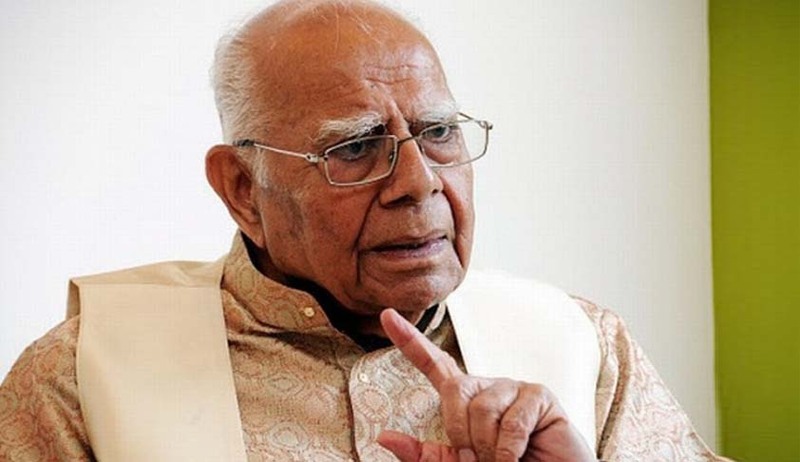 The nation owes them its heartfelt gratitude", said Senior Advocate and former law Minister Ram Jethmalani in his press statement about Today's Judgment on National Judicial Commission. Today’s Judgement delivered by the Hon’ble Judges of the Supreme Court of India striking down the National Judicial Appointments Commission (NJAC) as constitutionally ultra vires and invalid raise our respect and gratitude for the Judges as defenders of the constitution our panoply of human rights and democracy has gone up sky high. The nation owes them its heartfelt gratitude. I am glad I was on the right side of this controversy but our forensic success is mainly the achievement of my colleagues Fali Nariman, Rajiv Dhawan, Anil Divan, Arvind Datar and many assisting juniors. We are all enjoying the success and are proud of it. Now some comment for which I alone am responsible. This must bring some shame and remorse to the Prime Minister and his advisors. His crime serious enough is ignoring leaders of the Bar and well known constitutional experts in the field of law practitioners and teachers and preferring mediocrities with no distinguished record of protection of civil liberties and the core India’s constitution. To atonefor this grave crime against the nation the Prime Minister and those who made him adopt this horrid piece of legislation must resign office. The Prime Minister of course has a very plausible double defence of being a constitutional ignoramus and busy with world jaunts of course of no value to us at all. Democracy will have its revenge if you continue to weaken its foundations". Jethmalani represented Advocate Ashish Dixit before the Constitution Bench challenging the NJAC.